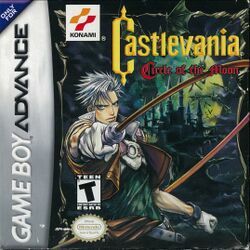 Castlevania: Circle of the Moon (simply titled Castlevania in Europe and Australia) was the first Castlevania game released by Konami for the Game Boy Advance. It followed in the new style of Castlevania games (called "Metroidvanias" due to the heavy influence of the Metroid series) that started with Symphony of the Night. Circle of the Moon has been removed from the official canon, and is therefore not part of the Castlevania timeline. Unlike other Castlevania games, the main protagonist is not one of the Belmont clan, but Nathan Graves of another vampire hunting clan. Nathan is apprenticed to Morris Baldwin, a veteran Vampire Hunter who helped defeat Dracula ten years ago. Now he, Nathan, and Hugh Baldwin (Morris's son and another apprentice) storm Dracula's old castle to stop one of Dracula's servants from resurrecting the Count. This page was last edited on 13 October 2018, at 18:28. This page has been accessed 95,535 times.